Yehey! I reached another milestone in my blogging career! 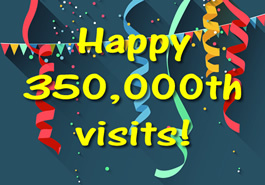 I reached my first 350,000th visits! Actually, it’s already 350,254 based on WordPress Stats. I have now published 393 blog posts which was shared 1,859 times. I also accumulated 392 blog followers, 981 comments and 55 comment followers.